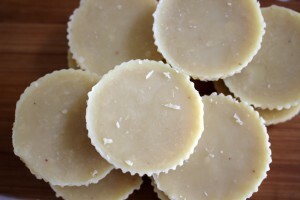 White Chocolate Cups - a healthy snack to curb your sweet craving! I haven’t eaten chocolate in almost two years. It is not allowed on the Specific Carbohydrate Diet (SCD). 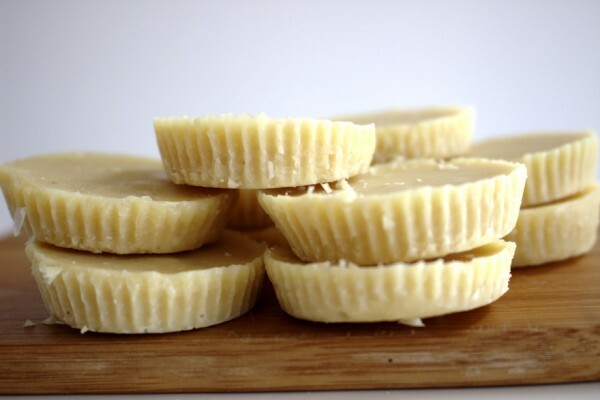 I recently discovered however that homemade white chocolate made from pure cacao butter is SCD legal. I can’t find any information from the late Elaine Gottschall that it is allowable. However, I’m guessing that cacao butter wasn’t readily available when she wrote the book “Breaking the Vicious Cycle”. The argument I read for allowing cacao butter is that it is pure fat extracted from the cocoa bean. It sounded good to me and I was willing to take the risk. 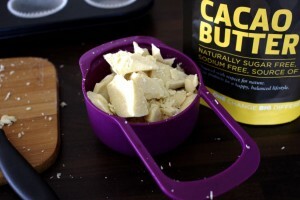 So you should know that I cannot say with complete certainty that cacao butter is allowed. I did however try it many times now and had no reaction so I am happy to consume it in moderation. After a seriously long time without chocolate of any kind, these white chocolate cups tasted like a little drop of heaven. My husband and daughter (a.k.a. my chief tasters) very much agreed they tasted amazing so I can assure you that I am not that biased :). They are surprisingly easy to make. The only difficult part is waiting for the chocolate to set in the freezer. The cacao butter taste is strong in a good way – think dark chocolate – so you actually won’t eat that many. I find one with a cup of tea really curbs my craving for something sweet. As always the key to my recipes is to buy quality ingredients. You should only buy pure cacao butter to make these white chocolate cups. I found it in my local health shop. Make sure to ask if it is suitable for eating. Apparently there is cacao butter for sale for making cosmetics that is not edible! There should be nothing at all added and only one ingredient: 100% cacao butter. I bought organic as there was little difference in the price anyway. I use hazelnut butter in this recipe which I make myself by soaking blanched hazelnuts overnight in water. The next day, I drain them and blitz them in a blender until I get hazelnut butter. I have an extremely powerful blender (a thermomix!) and I still need to keep stopping it to scrape down the sides. If you don’t have a very powerful one then I would suggest either buying your own hazelnut butter or substituting in some cashew or almond butter instead. Either way it will be delicious! 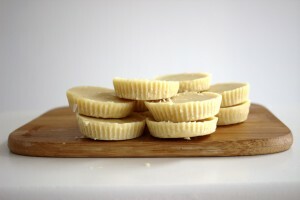 Delicious white chocolate cups free from: gluten, grains, dairy and refined sugar. Paleo and Specific Carbohydrate Diet-friendly also. Once melted, remove the cacao butter from the heat. 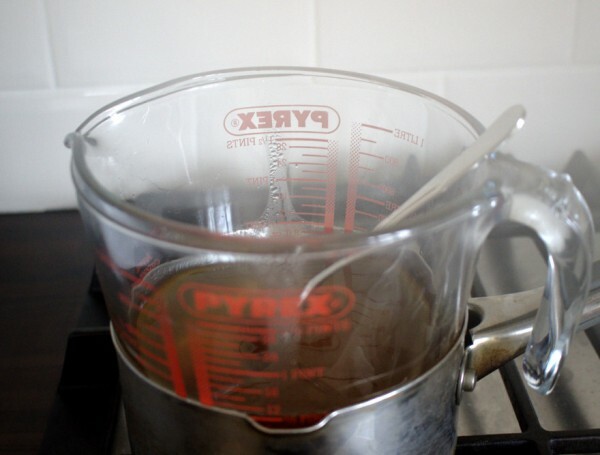 Add all the other ingredients to the melted cacao butter and mix using an electric mixer at high speed for a few minutes. Freeze for at least two hours until well set. I keep these in the freezer all the time. 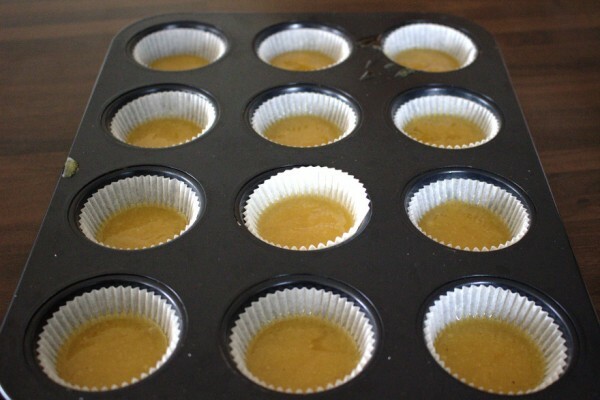 Then tend to melt if left out due to the coconut oil.